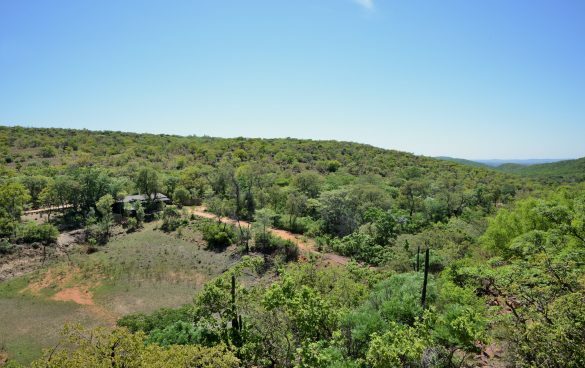 Nestled in the bush, the property gets its name from the plentiful birdlife that flock to the Nylsvley Nature Reserve, a 30-minute drive away. The two Owls Cottages combined is a rustic six-sleeper log cabin with private swimming pool and shared barbeque area in a lush setting of trees and shrubs. 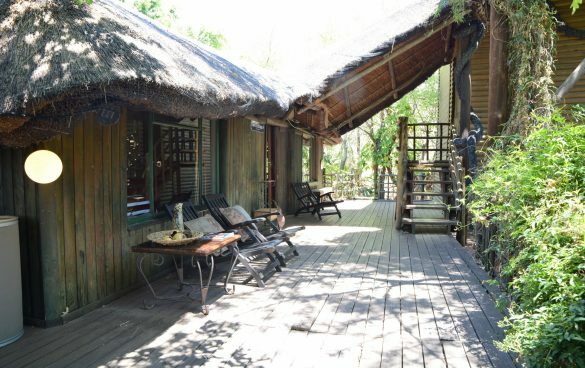 Situated on the furthest end of Birdsong, the Owls Cottages offers a very private hideaway for nature lovers that enjoy the bushveld and comfortable accommodation. 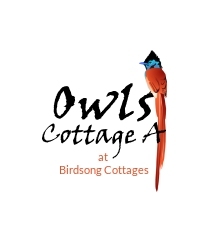 Owls Cottages comprises two units in one building, namely Unit A and Unit B, each with its own private entrance. Guests can therefore also book this unit as a two- or four-sleeper. When two or four guests stay here, they will have shared use of the private swimming pool. Both units have shaded outside parking. Unit A, accessed by walking past Unit B, is a charming wooden cabin constructed on one level and situated next to an orange orchard. This cosy unit features an appealing outside wooden deck in front with a seating area to the far left and is perfect for two couples. The entrance to the unit’s rustic living area leads into the kitchen. With its wooden couches decorated with comfy cushions, the living area features a flat screen TV with select DSTV channels. The wooden interiors are repeated in the kitchen that features a beautiful dining room table with benches, a fridge/freezer, three-plate electric stove, microwave as well as a kettle and toaster. The two bedrooms, each with double beds, lead off from the main living space. There is a shared bathroom with bath only. Complimentary hand soap, hand & body lotion, bath & shower gel, insect repellent. Please note that due to its location, there is no telephone signal at the Owls Cottages.